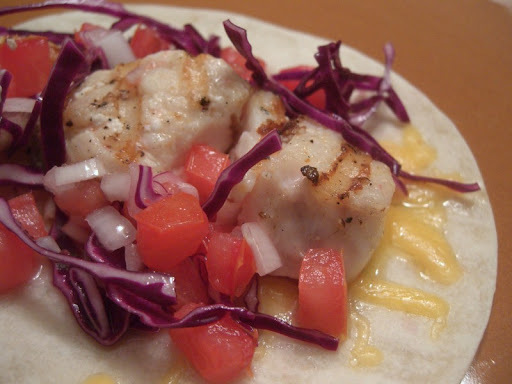 We've mentioned before that we really like the seafood tacos at South Beach Bar & Grille. It is one of the first places we hit up when we returned to San Diego from our travels in Mexico. 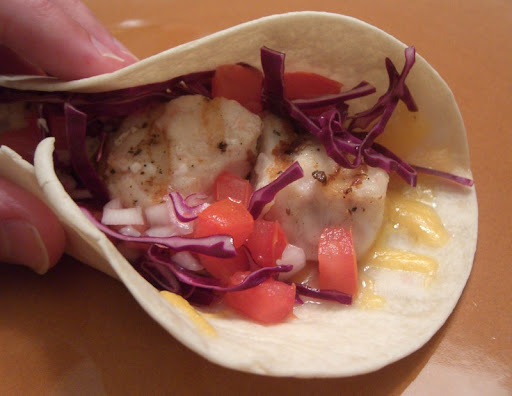 Inspired by the tacos at South Beach, we've been making our own that taste almost as good. 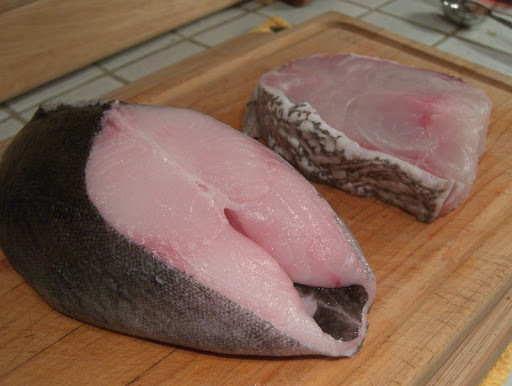 We've used a variety of different fish - this time we used black cod and grouper and but we've also used sea bass and mahi mahi. Large, firm-fleshed fish work best. 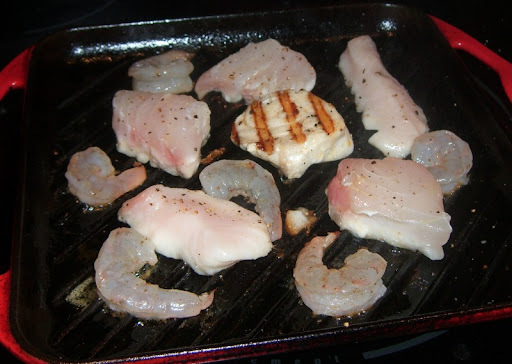 We cook the fish and shrimp indoors on a grill pan - we find it gives us more control. The key to these tacos, though is the salsa. 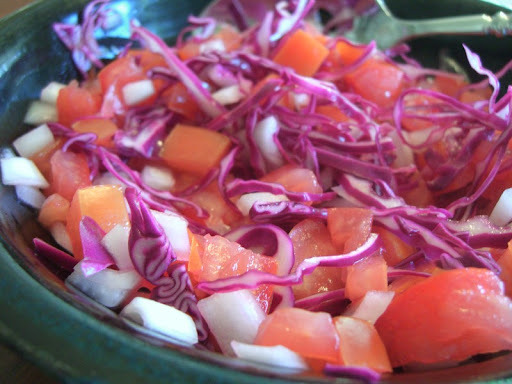 Tomato, onion and red cabbage are marinated with vinegar and a touch of salt. The result is a vibrant fresh salsa with a twangy bite from the vinegar. Our recipe is at the end of this post. 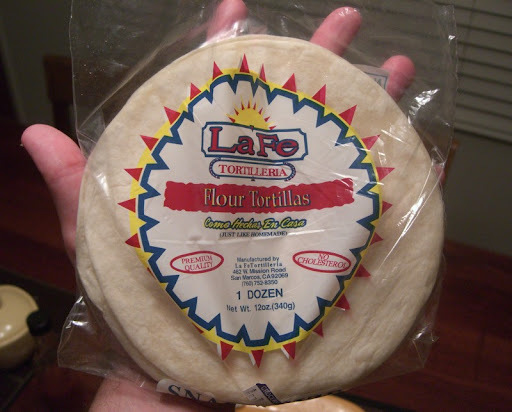 To make the tacos, we use "snack size" flour tortillas. While we generally prefer corn tortillas for most other kinds of tacos, South Beach uses flour and we find that they work really well with seafood. The small tortillas make for a perfect sized taco. I'm not a big fan of the traditional white sauce. 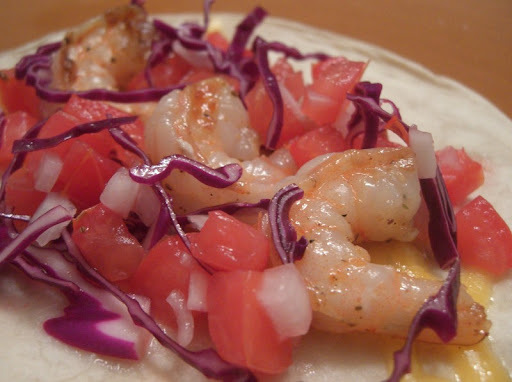 I find that particularly with grilled tacos (as opposed to battered and fried) it masks the fresh flavors of the seafood and the salsa. We do follow South Beach's approach with a tiny bit of melted cheddar on the tortilla however. Chop the tomato flesh into small dice. Mix with the onion, vinegar and salt. 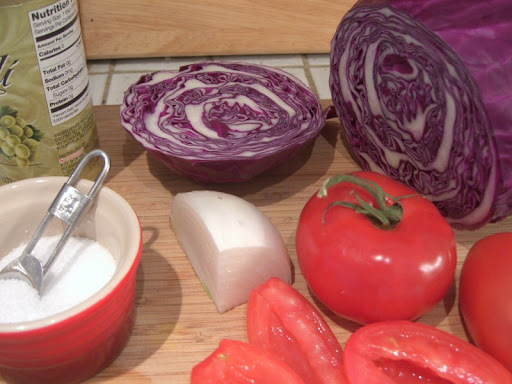 Carefully fold in the red cabbage. Let sit at room temperature one to two hours, stirring occasionally. Serve with a slotted spoon, or drain before using.